Ulika Food Blog: BBQ SAUCE OF THE WEEK: Thought-U-Knew! BBQ SAUCE OF THE WEEK: Thought-U-Knew! Despite its txtspk-esque name, J.Dogg Phair's "Thought-U-Knew!" Bar-B-Q Sauce is a classic man's man sauce if ever there was one. First of all, this sauce is thick. And it's got lots of chunks swimming around in it. And I mean big chunks. Big chunks of chipotle peppers, big chunks of onion, and big chunks of bacon. Yes, that's right. And this time there's no mistakin' the bacon. It's very prominent in the flavor, adding depth to the rich ketchup base, and setting up the moderate burn of the peppers. This sauce has quite a bit of bite to it, actually, so heat-seekers should enjoy it. 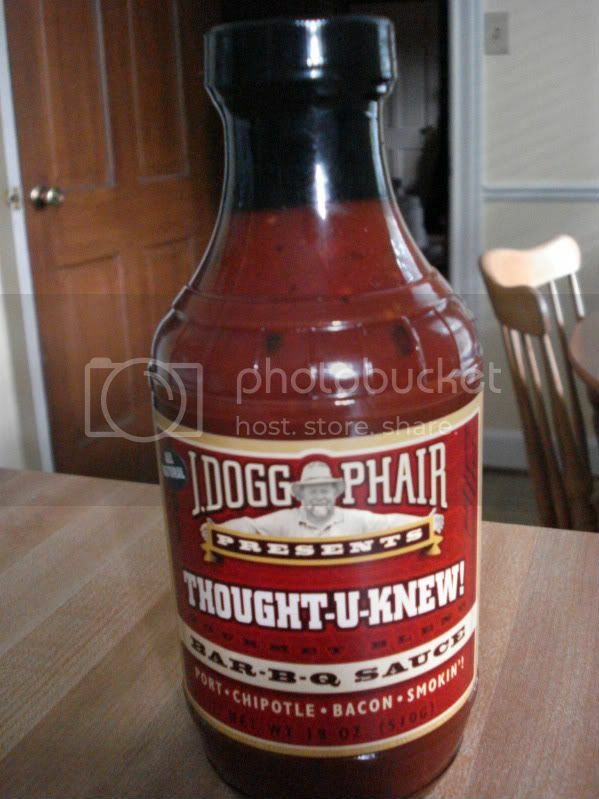 We have a bottle of J.Dogg Phair's Thought-U-Knew! Bar-B-Q Sauce to give away to one of our readers. All you have to do is visit the website and post a comment here. One winner will be randomly selected on the following Tuesday night and sent a free bottle of sauce. Just leave an email address so that we can contact the winner. I think the major meatloaf recipe sounds great! Thanks!